As described in our previous post, a decision by the NRC’s Director of NRR (DD-10-01) was released last week addressing certain contentions raised in a petition to the NRC Chairman by a former FPL nuclear employee. * In this post we address several aspects of the second issue raised by petitioner regarding the efficacy of the Employee Concerns Program (ECP). In brief the petitioner “raised issues related to weaknesses in the ECP as a means of getting issues entered into the CAP and "chilling effects" that exist at Turkey Point and are spreading to St. Lucie where employees are dissuaded from freely raising nuclear safety concerns to the NRC or within FPL for fear of retaliation by FPL management.” [DD-10-01] As described in the Director’s Decision, the petitions overlap a fairly prolonged history of weaknesses in the CAP at FPL and regulatory and licensee actions to improve the program. For example, the NRC held a public meeting on October 20, 2009 (ADAMS Accession No. ML093090274), to discuss FPL's processes for addressing employee concerns and planned, fleet-wide corrective actions for addressing FPL-identified weaknesses. The licensee indicated that it planned to implement 86 corrective actions to address the weaknesses. We found the results of the root cause analysis to be quite interesting, remarkable even. The RC went right to the issue of competing priorities, production taking precedence over safety, which we have argued many times may be the most important threat to safety culture. The root cause also correctly connects management actions, and the perception of those actions, as the linchpin of employee trust. Finally, CC 2.4 also explicitly identifies the reward and recognition system (read: compensation and promotion) as a potential conflicting influence on management decision making. We applaud this effort and the results it produced. Corrective actions were identified for each contributing cause. For CC 2.2 the approach was to implement a decision-making process that identifies risk criteria and communication requirements. It also establishes a DPO process. In our view this is an important and potentially highly useful approach, if implemented rigorously. We have argued that many of the decisions nuclear managers make are very nuanced and fuzzy in terms of safety implications. Reaching the appropriate decisions in an environment where other business priorities are also present creates the opportunity for the misperception of those decisions or decisions that do not adequately reflect safety priorities. Providing for a defined and open process, including explanation of how safety risks are considered, should improve decision making as well as the perception of those decisions by the organization. With regard to CC 2.4, the corrective action was to evaluate the current reward system and “ensure measures of NSC [nuclear safety culture] are considered”. [Slide 21] This action is hard to assess based only on the available documentation. As we have described in recent posts on nuclear compensation, we see potentially significant conflicts in current compensation structures given the amounts of compensation at risk for performance and the metrics used to trigger those incentives. FPL reported on progress in addressing its 86 corrective actions in a meeting with the NRC on April 20, 2010 [ADAMS Accession No. ML101110727]. Based on the FPL slides it is difficult to see exactly how some of the new processes are designed and whether they are effective. With regard to the reward system, it is simply stated, “Revised current reward system to ensure consistent health of NSC” [Slide 28]. We would have hoped that FPL would provide their analysis of specifically what aspects of the compensation system were found to be problematic with regard to safety culture and how the system was re-structured to mitigate the problems. It is more than likely that similar issues could exist in the compensation systems at other nuclear operators and the approach taken by FPL could be highly useful. We would welcome a post from FPL on this blog to provide such clarification. An article in today’s New York Times, “Workers on Doomed Rig Voiced Concern About Safety” reports on the safety culture on the Deepwater Horizon drilling rig that exploded in the Gulf of Mexico. The article reveals that a safety culture survey had been performed of the staff on the rig in the weeks prior to the explosion. The survey was commissioned by Transocean and performed by Lloyd’s Register Group, a maritime and risk-management organization that conducted focus groups and one-on-one interviews with at least 40 Transocean workers. This highlights several of the shortcomings of safety culture surveys. One, the vast majority of respondents to the survey indicated they were comfortable raising safety concerns - yet subsequent events and decisions led to a major safety breakdown. So, is there a response level that is indicative of how the organization is actually doing business or do respondents tell the the survey takers “what they want to hear”? And, is comfort in raising a safety concern the appropriate standard, when the larger corporate environment may not be responsive to such concerns or bury them with resource and schedule mandates? Second, this survey focused on the workers on the rig. Apparently there was a reasonably good culture in that location but it did not extend to the larger organization. Consistent with that perception are some of the preliminary reports that corporate was pushing production over safety which may have influenced risk taking on the rig. This is reminiscent of the space shuttle Challenger where political pressure seeped down into the decision making process, subtly changing the perception of risk at the operational levels of NASA. How useful are surveys if they do not capture the dynamics higher in the organization or the the insidious ability of exogenous factors to change risk perceptions? The other aspect of the Transocean surveys came not from the survey results but the rationalization by Transocean of their safety performance. They “noted that the Deepwater Horizon had seven consecutive years without a single lost-time incident or major environmental event.” This highlights two fallacies. One, that the absence of a major accident demonstrates that safety performance is meeting its goals. Two, that industrial accident rates correlate to safety culture and prudent safety management. They don’t. Also, recall our recent posts regarding nuclear compensation where we noted that the the most common metric for determining safety performance incentives in the nuclear industry is industrial accident rate. The NY Times article may be found at http://www.nytimes.com/2010/07/23/us/23hearing.html. In Part 1 we provided the results of our survey of nuclear executive compensation levels, structure and performance metrics. In this post we try to ascertain what impact, if any, these factors could have on nuclear safety culture and safety management. To us there were several fairly striking observations from the data. One, the amounts of compensation are very significant for the top nuclear executives. Two, the compensation is heavily dependent on each year’s performance. And three, business performance measured by EPS is the key to compensation, safety performance is a minor contributor. A corollary to the third point might be that in no cases that we could identify was safety performance a condition precedent or qualification for earning the business-based incentives. Some specifics. Generally the compensation programs state that they are designed, in part, to reward safety and other stewardship goals. Sometimes the term “operational excellence” is used and can include “safety” but it is difficult to know what this encompasses as SEC filings include various levels of specificity. In other cases the term “culture” is used but in general the context is not nuclear safety culture. * Some incentive plans state they are designed to prevent “promoting excessive risk” or unnecessary risks. These plans did not discuss any specific penalties or reductions in incentive linked to risk so it is difficult to judge how they are intended to accomplish the goal. 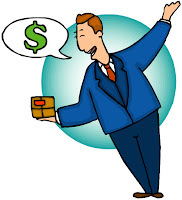 It may be that using company stock for significant parts of the incentive payout is intended to ensure that executives have an interest in protecting their ownership stake. By far the most common metric in the incentive programs associated with safety is industrial safety accident rate and/or fatalities. This is understandable in that across the enterprise of a power generation company, industrial safety is a common goal and can be measured on a common basis. Generally, fatal accidents result in a safety penalty in the incentive program, and the penalties could reduce the total incentive by about 5-10%. The largest safety impact on incentive that I came across was a 10% factor for OSHA safety and 10% for nuclear safety culture. One caveat is that the incentives and executives described in SEC filings necessarily represent the very top level of the enterprise. The specifics of incentive programs for lower tier executives, including those within the nuclear operating organization, are not available. However, it seems a safe assumption that the design of the incentive program is carried down the organization to at least the VP level, including significant performance incentives, but with metrics weighted more to business unit performance. What is the significance of these compensation programs to nuclear safety management, if any? First, with regard to total compensation, the high levels recently achieved could be viewed as a positive in assuring that the highest quality management is attracted and retained in nuclear operations. The responsibilities of nuclear executives are unusually large, complex and unremitting. While the totals are eye-popping, viewed in the context of the compensation for other executives in the enterprise, there is only parity. With regard to the structure of compensation - the amounts that are based on performance and the metrics used to define goals - there may cause for greater concern. As shown in Part 1, with 60-70% of total compensation at risk, executives can see their compensation, and that of the entire management team, impacted by as much as several million dollars in a year. And almost all of that incentive is based on business goals such as EPS, cash flow, budgets, and plant performance. As we have commented many times in this blog, we view achievement of nuclear safety culture as a process of successfully balancing safety goals with other competing business priorities. That context is unavoidable. Simplistic statements that “safety is our highest priority” do not reflect the reality of day-to-day decision making, or insulate decision makers. The balance is complicated and difficult since decisions are rarely black and white. And we have seen time and again, bad outcomes can evolve from a series of decisions and judgments that tilt the wrong way, apparent only in retrospective. When executive incentive programs weight business goals 90% and some aspect of safety 10%, what is the message? How does it not amplify the pressure on the executives and possibly skew the balancing act? How does it “prevent promoting excessive risk” as some compensation plans state? In Part 3 we will discuss whether executive compensation should be an element of nuclear safety culture and what might be done to ensure that it reinforces the commitment to safety. * In one case “People, Culture, Reputation” as a goal is expanded to mean: employee performance appraisals, executive-level employee diversity, ethics and compliance training, corporate values, and regulatory compliance. It counts for 10% of the total incentive. We have posted previously on the general topic of competing priorities (cost, schedule, political, personal career interest, etc.) being a potential issue for nuclear managers to balance in making safety decisions. We have also recently posted regarding the possible influence that cost and schedule pressures may have had on BP personnel in the events leading up to the spill and in several prior BP accidents. Lastly we highlighted some research results that suggest that compensation incentives may have perverse impacts on desired results. In this post we turn directly to the issue of compensation for executives with corporate responsibilities for nuclear plants and their operations. In subsequent posts we will discuss the potential implications of compensation on nuclear safety management. We researched compensation data that was available in SEC filings of public corporations owning nuclear facilities. As a practical matter this is the only publicly available information on this subject. In their annual prospectus, corporations disclose data for the top five compensated executives - the CEO and four other “NEOs” (Named Executive Officers). In some cases the executive who is the Chief Nuclear Officer is an NEO. In other cases a higher level executive, typically head of the generation business unit or other operating officer, is the NEO with direct, attributable responsibility for the nuclear facilities. To obtain an overview of compensation practices we looked at CNOs when available and, if not, the responsible NEOs . We compiled data for compensation levels, the structure of compensation, and the performance metrics being applied by the corporation. For NEOs with direct nuclear responsibilities, total average annual compensation is now $2.5-3 million (the range for our sample was approximately $1.25 to $5 million). We counted salary, annual bonus, non-equity incentive awards and equity incentive awards. We did not include changes in retirement benefit accruals (which can be quite large as well) or other miscellaneous fringe benefits. 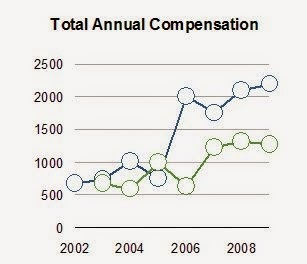 In virtually all cases the level of compensation has shown a significant increase in the last 3-4 years. This may reflect increased competition for nuclear executive talent rippling through the industry and/or the increased business value associated with nuclear generation assets. The figure below illustrates how compensation has changed over recent years in two nuclear organizations, one operating a single unit and the other a small fleet. We also examined the structure of executive compensation with an emphasis on the amounts of compensation that are fixed on an annual basis (typically salary and benefits) and those amounts that are “at risk”, meaning they are performance-based. We found that compensation is heavily incentive based where the amount of total compensation that is earned based on performance now averages greater than 70% (the range for our sample was 60% - 80%). 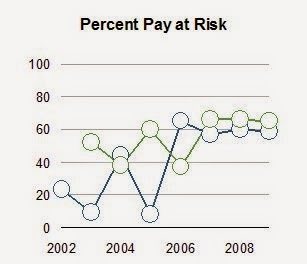 As with total compensation, the percent of compensation at risk has increased significantly in the last 3-4 years. The next figure shows the trend lines for the same two corporations as in the first figure. These results are not an accident as the SEC filings for these corporations set out compensation policies that are heavily weighted toward performance. For the most part incentives are based on the current year performance though for some specific incentives such as stock options, rolling three averages may be used. The principal objective appears to be to align executive pay with shareholder interests. Typically the compensation structure uses a combination of corporate level performance and business unit performance to determine incentive payouts. At the highest level of the organization, the CEO, metrics may be exclusively corporate level and almost always focused on earnings per share (EPS). Lower tier executives generally have a significant portion (60-70%) of their incentive determined by corporate performance (almost always EPS) with the remainder determined by business unit or personal goals. The metrics for nuclear business units are typically capacity factor and budget based, occasionally using an index of 8-10 metrics. This performance will generally be associated with about 20% of the total incentive. The remaining 10% of incentive is usually associated with some type of safety performance. OSHA industrial safety measures are most common though we identified one corporation that used a “nuclear safety culture” metric. In Part 2 we will try to ascertain what impact these factors could have on nuclear safety culture and safety management. An article in the June 29, 2010 Wall Street Journal, “As CEO Hayward Remade BP, Safety, Cost Drives Clashed”, fills in some real world examples of the dynamics of conflicting goals within BP and presumably contributing to the current spill disaster. The presence of compensation incentives may have played a role in how safety vs. cost decisions were being made. We will be focusing more on this issue in upcoming posts.